So-called ‘pro-poor’ social protection programmes lead to fewer of the poorest being covered, and beneficiaries receiving lower transfer values, a seminar in The Hague has heard. Development Pathways’ Senior Social Policy Specialist Stephen Kidd presented evidence on the effectiveness of different approaches to targeting in social protection at the the International Institute of Social Studies event last week, with the presentation and recording now available. Stephen Kidd presented evidence that demolished claims from the World Bank that given there are finite resources, it is more ‘pro-poor’ to restrict social protection programmes to the poorest. He showed how attempts to target the poor in Europe after the French revolution led to poor relief programmes that were dramatically cut back in the 19th Century. Programmes that were for everybody, meanwhile, have been sustained. 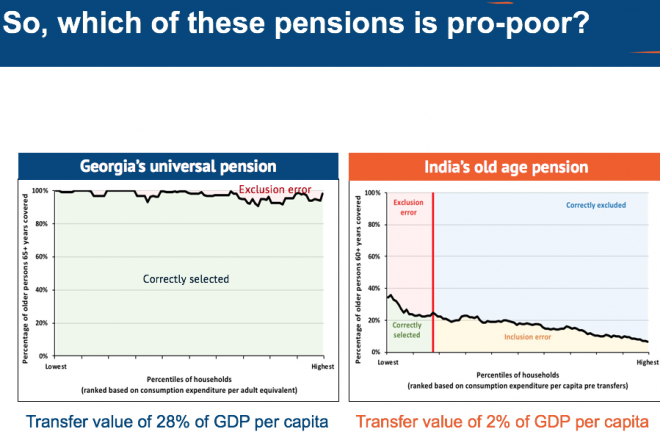 “The more people covered by a programme, the more popular it will be, and the more funding it will attract, so the higher the transfer,” he told the audience, pointing to evidence that nations with non-authoritarian regimes with higher coverage of pensions are associated with schemes with higher transfer values. Conversely, the poverty-targeted scheme in India is only accessed by less than four in ten of the poorest people who are eligible. The seminar in The Hague was organised and hosted by the Political Ecology Research Group of the ISS and co-sponsored by the AIDSOCPRO research project (Aiding Social Protection: The political economy of externally financing social policy in developing countries). The seminar was chaired by Dr Andrew Fischer, Associate Professor in Social Policy and Development Studies.